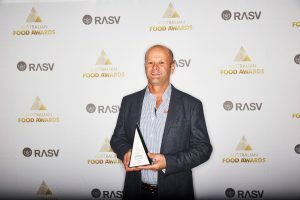 Stockyard’s Wagyu was awarded the Champion Meat at the prestigious RASV Australian Food Awards (AFA) held in the Master Chef Kitchen on Thursday 7 September. Stockyard Wagyu Black received a Gold medal in the Branded Beef Class, the Best in Class, Consistency of Excellence Award and Champion Australian Meat. Stockyard Angus Gold performed exceptionally well, receiving a Silver medal in the Branded Beef category. The judges said Stockyard’s standout steak, produced at Kerwee Feedlot on the Darling Downs, displayed exceptional eating and visual qualities. This follows recent strong performances in the 2017 Australian Wagyu Branded Beef Competition and Branded Beef of Show at the prestigious Royal Queensland Branded Beef Competition to truly confirm its place as Australia’s most awarded beef brand. The Hart Family’s Kerwee Group celebrates its Diamond Jubilee this year with 60 years of family farming and production of high quality branded beef. Growing demand from retail and food service for Stockyard Wagyu and Angus has given the group confidence to expand it’s capacity to over 20,000 head. Stockyard continues to partner with exclusive distributors and customers around the world to deliver the finest quality and consistency.